Quaiit Studios is run by Nelli-Jeanne Lucus from Athens, GA and was started in late 2015. From a young age, NJ loved dressing up and she still loves to do it, now as a cosplayer. 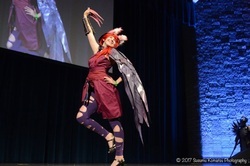 Her goal is to inspire and encourage others to get into cosplay and not let their body type, age, or interests keep them from cosplaying. She hopes to get this point across, because when she was younger people used to bully her for what she was into and her goals. All of that has now turned into the studio she has today, making costumes for herself and others while inspiring people to achieve what they love and want to do in life.